What is a Hearing Aid Telecoil and How Does it Work? Home » Blog » What is a Hearing Aid Telecoil and How Does it Work? A hearing aid telecoil (t-coil) is a small copper antenna inside some hearing aids. Hearing aid telecoils operate by receiving and selectively converting electromagnetic energy into sound which can be heard by the hearing aid user. These sound signals (microphone or direct audio input) are projected into the environment by a loop system. This process, known as near-field induction, is widely used in many big cities across the United States and in Europe. Phoenix, Arizona has many music venues, drama theaters and movie theaters equipped with loop systems. 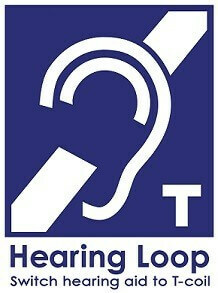 Loop systems consist of a loop wire that goes around the listening area or on a lanyard worn by the hearing aid user. Using a hearing aid telecoil in conjunction with a loop system allows hearing aid users to hear voices and music much more clearly. You need to know if you have a telecoil inside your hearing aid and how to use it. Contact your Audiologist if you aren’t sure. When going out, contact the venue ahead of time and inquire if they have a “loop system” installed. If you are already out, check with the customer service to ask if they have a loop system installed. If they do, they will instruct you on how to connect to it with your hearing aids. Do not hesitate to contact your audiologist if you have questions about hearing aid t-coil compatibility, or if you would like to obtain a hearing aid with a telecoil. This entry was posted in Hearing Aid Info. Bookmark the permalink. What’s The Difference Between a Hearing Aid and a Personal Sound Amplifier? What is Tinnitus is there Treatment? Why Should I Buy Hearing Aids from Costco or Big Box Stores?